If you’re salivating over Nvidia’s recently launched GeForce GTX 1080 graphics card and your wallet simply refuses to give in to that hefty $700 price tag, don’t fret just yet, as the company and its partners released on Friday a cheaper alternative that’s still better than any Nvidia-based graphics card currently available on the market, even the coveted Titan. It’s called the GeForce GTX 1070, and its base price is only $450. Sure, it’s not as meaty as the GTX 1080, but you’ll have plenty of spare change left over to grab a cup of coffee before heading home and cramming that shiny new card into your system. 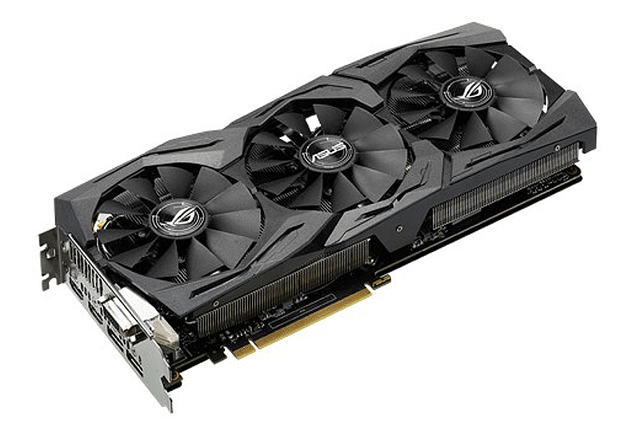 Naturally, Asus has released its take on the GTX 1070 GPU under the “Republic of Gamers Strix” branding. Like the ROG Strix GTX 1080 card that came before it, this cheaper model sports the company’s DirectCU III cooling system containing three patented 0dB wing-blade fans along with heat pipes that make direct contact with the card’s GPU chip. Thanks to this system, heat is seemingly ripped away, increasing performance by up to 30 percent and enabling operation that is three times quieter when compared to the original GTX 1070 reference design. Staying on the cooling theme, the new ROG Strix GeForce GTX 1070 card includes the company’s FanConnect technology as well. 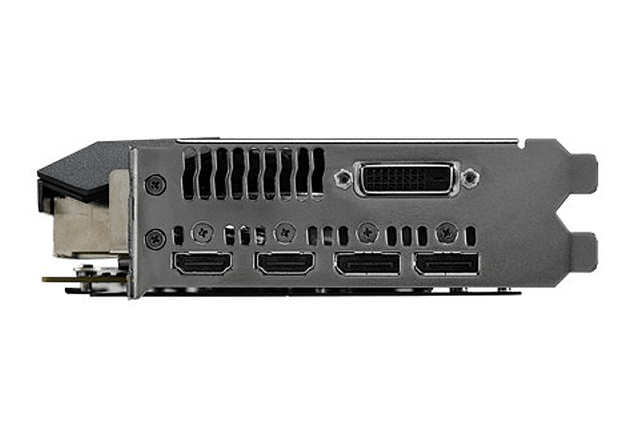 Essentially, Asus has thrown two 4-pin GPU-controlled headers onto the card so that the system fans can be utilized too. That way, when the GPU begins to build up heat during gaming sessions (it gets hotter than the CPU), the system fans can be revved up to help cool the chip down. Super Alloy Power II components used on the card help keep the overall thermals down, too. 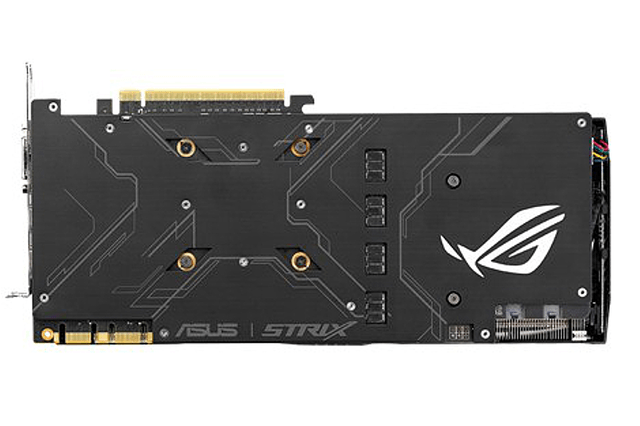 For system builders looking for a little pizzazz in their graphics cards, the new ROG Strix solution includes Asus Aura RGB lighting on the backplate and the shroud, illuminating the nearby components. This system includes six different effects and is capable of generating “millions” of colors so that customers can match the new card’s illumination with the system’s overall color scheme. Other bells and whistles noted with the new GTX 1070 card include dual HDMI ports so that one can be used for the monitor and the other used for a VR headset like the HTC Vive and the Oculus Rift. GPU Tweak II software is thrown into the box too for “seasoned” overclockers and customers wanting to optimize the operating system for games. There’s even a one-year subscription to XSplit Gamecaster Premium as a bonus. So what makes the GTX 1070 chip different than the GTX 1080? For starters, the number of CUDA cores is lower, down to 1,920 from the GTX 1080’s 2,560 count, which means the card has a slightly lower power requirement. This newer card also uses vanilla GDDR5 memory whereas the GTX 1080 has faster, newer GDDR5X memory. The maximum boost clock speed is lower too, down to 1,860MHz compared to 1,936MHz on the GTX 1080. 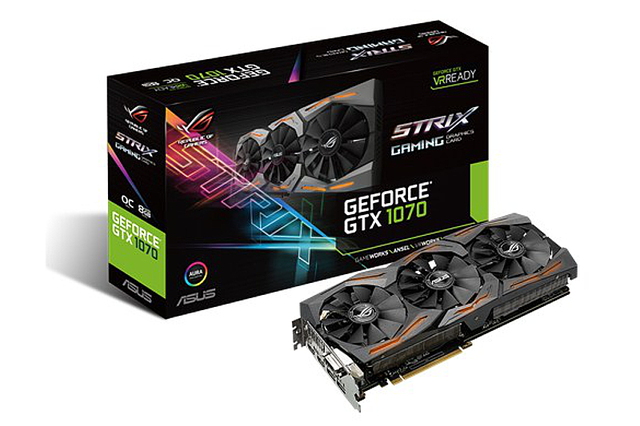 The Asus ROG Strix GeForce GTX 1070 card is available now in two flavors: the Strix-GTX1070-8G-Gaming model for $430 and the Strix-GTX1070-08G-Gaming model for $450. The difference is that the former, less-expensive card has a 1,683MHz boost clock in gaming mode and a 1,721MHz boost clock in OC mode. The latter card has a 1,835MHz boost clock in gaming mode and a 1,860MHz boost clock in OC mode. However, both models include one DVI-D output, two HDMI 2.0 outputs, and two DisplayPort 1.4 outputs.